Several years ago I was involved in a case (supervising a CRNA) where the gynecologist had trouble with a hysterectomy and started to lose a little blood. The blood loss was slow and steady. Therefore, no panic ensued when it was discovered that this patient had inadvertently gone back to surgery without an up-to-date type and screen. Furthermore, when we looked in the system, it was discovered that she had had antibodies on her most recent type and screen. So going forward, a decision had to be made regarding a transfusion trigger given that we would be giving blood that may be incompatible with her antibodies. I have written peripherally about this issue in a couple of earlier posts in this blog: Acute hemorrhage in obstetrics and antibodies in patient for fem pop from HIT. In this case we decided to hold off on transfusion as long as there were no overt signs of the patient reaching the inflection point on the VO2 DO2 graph and the Hgb remained above 6 g/dL. Essentially this meant that we recognized that for this otherwise healthy female, oxygen delivery (DO2) was far in excess of tissue oxygen utilization (VO2). In fact, for a typical healthy female under anesthesia VO2 will be about 200 mL of oxygen every minute. DO2 is far in excess of this at 780 mL of oxygen per minute. (assuming Hgb of 12 g/dL, C.O. of 5 L/m, sat of 98%). This indicates that we can continue to decrease Hgb without compromising VO2. The degree to which anemia can be tolerated while maintaining normovolemia has been carefully reviewed with many published data. The key parameter in these studies is hemoglobin critical (Hgbcrit), the point where VO2 becomes dependent on DO2, or tissue hypoxia begins. It has been found to range from as low as 1.1 g/dL up to 4 g/dL in humans. In general, based on a review, it appears that mortality increases when Hgb gets below 5 g/dL for any sustained amount of time . Unfortunately, this Hgbcrit of 5 g/dL is an average, and it may be much higher in any particular patient (or much lower). Therefore, patients can sustain a significant drop in Hgb (assuming maintenance of normovolemia) without any significant longterm sequelae. To understand this it is important to understand the physiology underlying oxygen transport and utilization. If we look at CaO2 (arterial content of oxygen) as Hgb goes from 12 to 4 g/dL we see that at Hgb of 12 we have 1576 mL of oxygen in each dL of blood. (assume a fixed sat of 98% and PaO2 of 100 mmHg). As our patient drops to 4 g/dL CaO2 goes to 525 mL. This is exactly as expected, a 3 fold decrease. At a cardiac output of 5 L/m, DO2 would now be at 260 mL of oxygen per minute. This is just above the threshold for total body oxygenation. But, clearly DO2 does not necessarily drop to this level. As Hgb drops compensatory mechanisms attempt to maintain DO2 despite a falling CaO2. First, C.O. increases in order to improve DO2. The rheologic properties of blood change as it becomes more dilute, allowing for offsetting of afterload aiding in myocardial function. In awake volunteers, C.O. is increased predominantly via increased HR. In anesthetized patients, SV will increase assuming adequate volume loading. Total body oxygen extraction increases (O2ER). However, brain and heart tissue maximally extract oxygen at baseline, and therefore rely upon increased perfusion to maintain oxygenation as CaO2 falls. This can occur because the viscosity of blood decreases as it is diluted and also by circulatory redistribution from non critical tissues to critical (i.e. brain/heart). It is important to remember that DO2 and VO2 as discussed above is total body, and ignores what is going on at the cellular or organ level. This is important since if you were to measure mixed venous saturation and noticed that it remained stable despite a significant drop in Hgb, this does not guarantee that some tissue beds may already have their VO2 dropping due to lack of oxygen, while other tissue beds compensate for this. In our patient bleeding was occuring yet avoidance of transfusion was important. While there are large amounts of data and publications on the harmful effects of blood transfusions as well as how to avoid them, clinicians in practice often have a very low threshold to institute transfusion. This is often done using a gestalt of what they think the patient needs based on the basic hemodynamic parameters such as heart rate and blood pressure as they considere the patients medical history. In our patient, transfusion carried higher risk of harm as there were no units that were antibody matched available. At the time of the case I was unaware of some of the studies looking at this exact scenario. Using a Pig model, Habler O et al. found that after hemodiluting the animals to Hgbcrit (i.e. Hgb level at which signs of tissue hypoxia begin), by using hyperoxic ventilation (HV), they were able to dramatically decrease mortaility (by 85%). This group took pigs, hemodiluted them to their individual Hgbcrit (indirect calorimetry) while breathing 21% oxygen. At this point half of the group was switched to 100% oxygen while the rest remained on RA. Over the next 6 hours this regimen was maintained. All pigs maintained on RA died. Only 1 animal died (from 7 total)in the group given 100% oxygen. After the first 6 hours, the survivors (i.e. those given 100% oxygen) were switched back to 21% oxygen. Within 3 hours these animals died. This group took careful measurements of the CaO2 and what portion of it was attributed to oxygen bound to Hgb vs. dissolved in blood. The question becomes, does this article help us understand something different about oxygen utilization that goes against conventional wisdom, i.e. 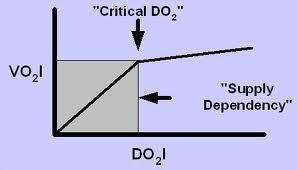 should we not ignore dissolved oxygen as part of the equation of DO2? In this particular study, CaO2 at Hgbcrit on RA went from 4.1 mL/dL to 5.8 mL/dL. This change in content (1.7 mL/dL) was the difference between life and death, and by calculation equals the amount of oxygen that can be carried by 1 g of Hbg (assuming 1 g of Hgb binds 1.39 mL of oxygen and is saturated at 98%). Feiner et al. have proposed in the Sept 2011 Journal of Anesthesiology, that this additional dissolved oxygen is 100% available to tissues, whereas only a small fraction of Hgb bound oxygen can be extracted. As proposed by Feiner et al. if you add 94 mmHg to a PaO2, then you will add 0.29 mL/dL of utilizable oxygen (94 x 0.0031). As it turns out, this is the same amount of utilizable oxygen from 1 g of Hgb (assuming saturation of 97%) [1.34 x (97%-75%)]=0.29 mL/dL. It should be recognized that this line of reasoning is novel as the traditional teaching of DO2 has focused primarily on the oxygen bound to Hgb while ignoring the dissolved portion. Feiner et al. published this idea in their recent study highlighted in my previous post where his colleagues were able to show that hyperoxic ventilation reversed the increase in HR accompanying HD to an extent equal to 3 g of Hgb (i.e. transfusion of ~3 units of blood). Based on the calculations above, 100% oxygen provided an equal amount of usable oxygen (0.29 mL/dL x 3= 0.9 mL/dL). Other studies have confirmed the benefits of HV ventilation in acute hemodilution (HD) . In Pigs hemodiluted down to a critical Hgb (Hgbcrit) of 2.3 g/dL on RA, switching to 100% enabled a further hemodilution down to 1.2 g/dL . Calculations done in this study are instructive of how the contribution of oxygen from Hgb vs. dissolved changes with a loss of Hgb in dilutional anemia. According to the authors, a lower threshold for Hgb of 1.5 g/dL exists based on previous studies. In this situation the oxygen comprising CaO2 comes equally from Hgb bound and dissolved (1.5 g/dL x 1.34 mL/g x 0.98)=1.96 mL/dL Hgb bound; (0.0031 x 650 mmHg)=1.95 mL/dL. However, the percentage available to tissues is largely from oxygen that is dissolved assuming that only a fraction from Hgb can be extracted and utilized. So in our particular case, where a blood transfusion was not readily available, it appears from the studies and logic presented that hyperoxic ventilation would be an appropriate temporizing bridge until a matched unit of blood could be made available. It needs to be underscored that strict maintenance of normovolemia occurred in the above cited studies and would be critical in our patient. Furthermore, waiting until actual evidence of having reached the Hbgcrit in a clinical situation such as ours (i.e. EKG changes, dramatic decrease in Mixed venous oxygen saturation etc) is not advisable. These represent inadequate DO2 of the whole body, while other organs may have already reached their threshold. Therefore, the totality of the patient should be considered (co morbidities, baseline starting Hbg, rate of blood loss, actual achieved PaO2, etc), when deciding the threshold for transfusion. In the last part in this series on Hyperoxic ventilation and how it relates to DO2, I will discuss potential negative effects of hyperoxia and consider it's role in DO2 in a patient who is in a low flow state (i.e. severe hypotension during surgery). Please look for the next entry!! 1. Viele MK, Weiskopf RB. What we can learn about the need for transfusion from patients who refuse blood. Transfusion 1994;34:396. 2. Meier J, Kemming GI, Wedel-Kisch H, Wolkhammer S, Habler O. "Hyperoxic ventilation reduces 6-hour mortality at the critical Hemoglobin concentration". Anesth 2004;100:76-8. 3. Habler O et al. "Hyperoxic ventilation enables hemodilution beyond the critical myocardial hemoglobin concentration" Eur J Med Res 2005;10:462-68. 4. Pape A, Meier J, Kertscho H, Steche M, Laout M, Schwerdel F, Wedel M, Zwissler B, Habler O. "Hyperoxic ventilation increases the tolerance of acute normovolemic anemia in anesthetized pigs. Crit Care Med 2006; 34:1475-82.